The difficulty of detecting and quantifying oil in the ocean has limited our understanding of the fate and environmental impact of oil from natural seeps and man-made spills. 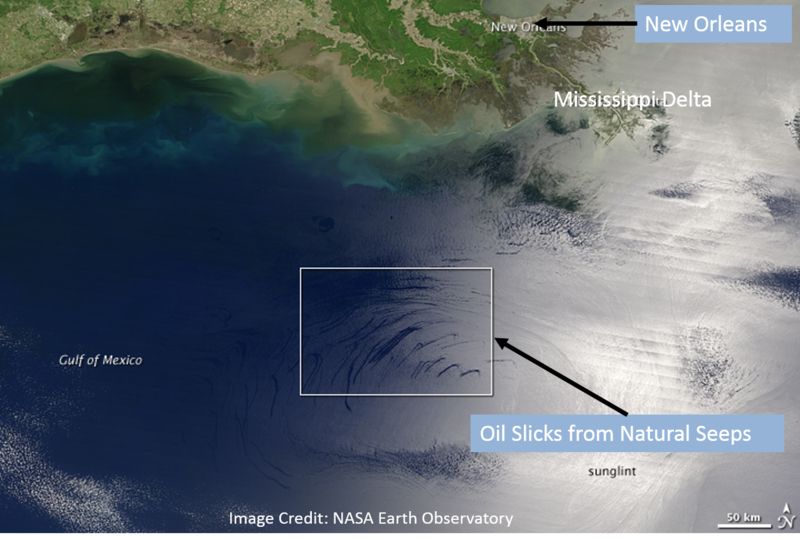 Oil on the surface can be detected by satellite (figure 1) and studied with optical instrumentation, however, as researchers look deeper to study oil as it rises through the water column, the rapid attenuation of light in the ocean limits the usefulness of these systems. Active sonar – where an acoustic transmitter generates a pulse of sound and a receiver listens for the sound reflected from an object – takes advantage of the low attenuation of sound in the ocean to detect things farther away than optical instruments. However, oil is difficult to detect acoustically because oil and seawater have similar physical properties. The amount of sound reflected from an object is dependent to the object’s size, shape and a physical property called the acoustic impedance – the product of the density and sound speed of the material being measured. When an object has an acoustic impedance similar to the medium that surrounds it, the object reflects relatively little sound. The acoustic impedance of oil (which differs by type of oil) and sea water is often very similar. In fact, under certain conditions oil droplets could be acoustically invisible. To study oil acoustically, we need to better understand the physical properties that affect its acoustic impedance. Most measurements of the density and sound speed of oil come from oil exploration research which focuses on studying oil under reservoir conditions – high temperatures and pressures associated with oil deep underground. As oil cools to oceanographically relevant temperatures it can transition from a liquid to a waxy semisolid. This transition may result in significant changes to the acoustic properties of oil which would not be predicted by measurements made at reservoir conditions. To inform models of acoustic scattering from oil and produce quantitatively meaningful measurements it is necessary to have well-understood properties at relevant temperatures and pressures. Density and sound speed can be measured directly, while the shape of an oil droplet can be predicted from the density and viscosity. Density and viscosity will tell you how quickly a droplet will rise, and how the drag force of the surrounding water will modify its shape. Droplets can range from spheres to more pancake like shapes that one could produce by pushing down on an inflated balloon. To better understand these important properties, we obtained samples of three different crude oils. Each sample was sent for “fingerprinting” to identify differences in the molecular composition of the oils. “Fingerprinting” is a technique used by oil exploration scientists and spill responders to identify different crude oils. Measurements of the sound speed, density, and viscosity were made from -10°C (14°F) to 30°C (86°F). A sound speed chamber was specifically designed to measure sound speed at the same temperature range but with the added effects of pressure (0 to 2500 psi – equivalent to approximately 1700 m depth, deeper than the Deepwater Horizon well). Light, medium and heavy crude oil was tested. Each of these is typically defined by their American Petroleum Institute (API) gravity. API gravity is a common descriptor of oils and is a measure of the density of oil relative to water. The properties of the medium and heavy crude oil are in the figure (2) below. The sound speed is different both in amplitude and shape, while the viscosity only differs in amplitude, suggesting that the changes to shape of the sound speed curve may not be related to the viscosity. The heavy oil is currently limited to measurements above 5°C because below that temperature it becomes very difficult to transfer sound through the oil. Part of this ongoing research is to develop new techniques to measure sound speed, and to use these techniques to extend our measurements of heavy oils to cold temperatures similar to those found in Arctic regions where oil can be trapped in ice. By better understanding these physical properties of oil, the methods and models used to detect and quantify oil in the marine environment can be improved. Figure 1: Satellite image of surface oil slicks from natural seeps. Figure 2: Experimental measurements of the physical properties of a Medium and Heavy crude oil.